The DRAGON SLAY Android Bluetooth Triple Mode Game Controller Gamepad (for PC, Android, Xbox One & Tablets) is a great option for those looking for multi-platform cross compatible gaming. 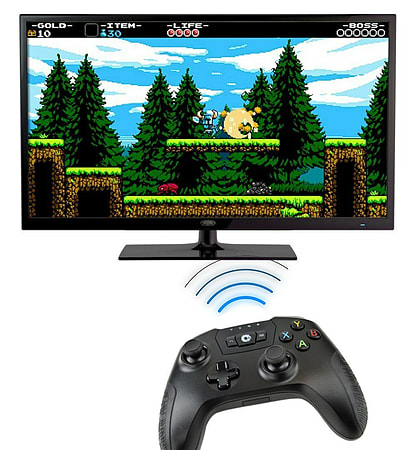 DRAGONSLAY Bluetooth Triple Mode Controller is compatible with Android 4.0 and windows 7 or later versions, via three main connections of 2.4Ghz/Bluetooth 4.0/wired connection, allowing for a great gaming experience across platforms, Android smart phones, TV boxes, tablets, Windows PCs, VR and Xbox One (streaming through to Windows 10). Works with multiple Android smartphones / tablets / smart TV / TV box /Windows XP/7/8/10 / Xbox One / Samsung Gear VR. Support Android/ Windows/Xbox One/ VR Bluetooth and 2.4G USB dongle connection mode, wired and wireless dual mode with super low latency. The controller automatically connects to compatible devices, it supports Xinput and Dinput modes. Works well with Android smartphone such as Samsung, HTC, MI, LG, HUAWEI, etc. Smart TV such as Fire TV, Samsung TV. Also wide selection of tablets and Gear VR. Comes with a removable adjustable bracket and wireless USB dongle , it can hold mobiles with screen size of 3.5 up to 6-inch smart phones. The mount can be easily detached to use via wireless or wired with Xbox One, TV or tablets. Large responsive D-pad makes it easier to discern between the eight compass points. 360-degree analog joysticks ensure high precision. Comfort grip for longer playing time, vibration feedback and enhanced trigger button for precise and accurate control. Ergonomic and attractive design made with toughened material. Controller is smooth and streamlined, it feels firm and comfortable to your palm thanks to the texturing on the surface. The layout of the buttons is perfect to enable fluent and efficient use, rubberized handles improves grip & stops hands from slipping.